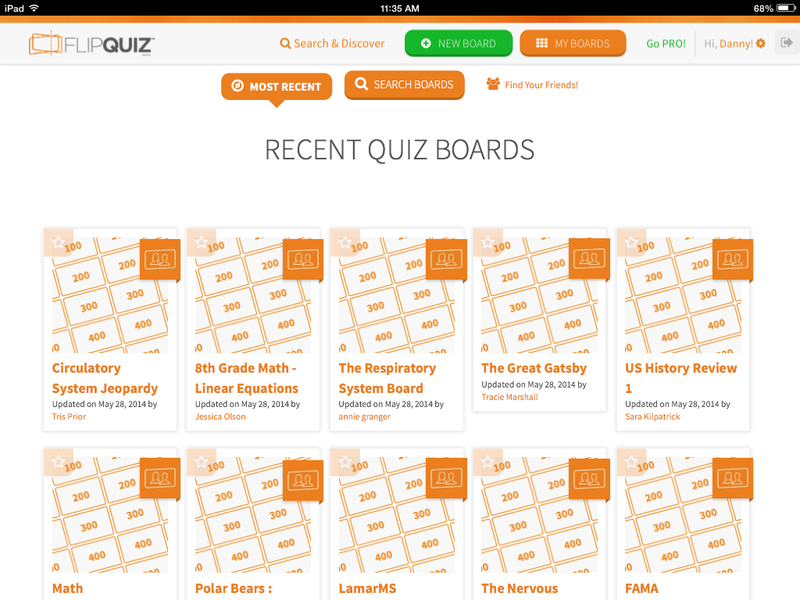 As finals approach, FlipQuiz is the perfect tool to use for reviewing course material with your students. It’s simple and free, but it will revolutionize the way teachers make review games. With FlipQuiz, all you have to do is sign up for free and you can begin making games or playing games made by other users. When you click on “New Board” you will be directed to a user-friendly interface. On the top you will see that you are able to give your board a name. Below that, there are six different tabs for the categories you can create. You are allowed up to five questions for each category and the questions should increase in difficulty as the point value increases because it is a Jeopardy style game. It is not necessary to make all five questions or fill all six categories, because the ones you leave blank will not appear on the game board you create. In other words, it’s fully customizable. You will also notice that on the top of each box you are given the options to format your text and add links, pictures, and videos to your questions and answers. I tested these features on my iPad and they worked really well. By clicking “my boards,” you will be directed to your profile dashboard. All of your created boards will show up under “my boards” and from here you will be able to edit, delete, and view your board. 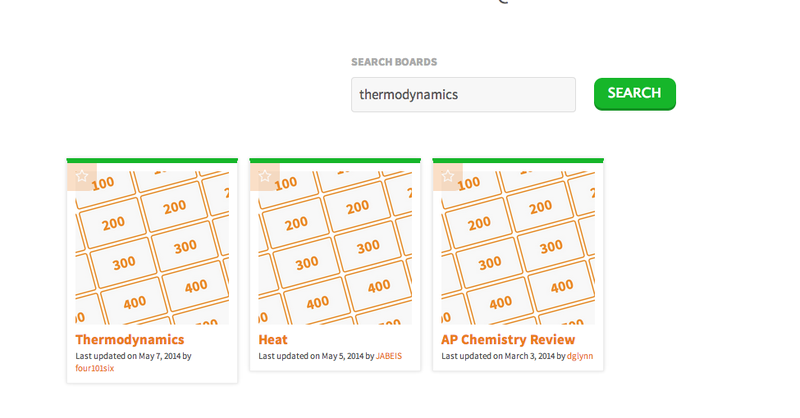 For a quick overview of what you created, simply click on the title of your board. To edit your board just click the pencil icon. This will allow you to edit your board in the same fashion you created it with. To test or play your completed game, press the game board icon. Simply click on any of your questions and they will be shown across the screen. When a student has answered, just click “reveal answer” and then click close on the top right of the screen to return to the board and answer the remaining question. Just like the Jeopardy game, students can answer questions in any order they want. Example of a Board – Click the image below to be taken to the FlipQuiz demo board to see the tool in action! 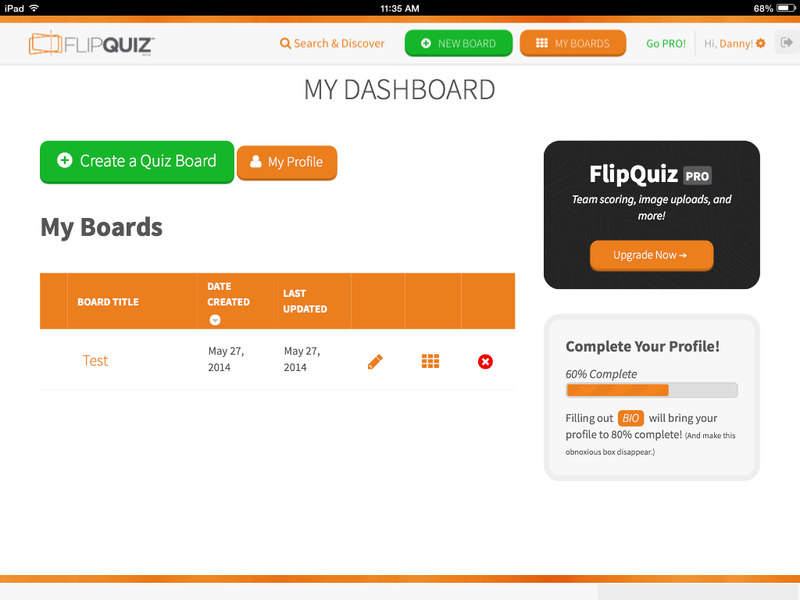 Although FlipQuiz is a great tool, it lacks some useful features in the free version. The pro version is quite pricey at $7 a month or $70 per year (2 months free). Unless you are going to be using this tool frequently, it’s probably not worth upgrading to the pro version. FlipQuiz is a very useful tool in the classroom. With little time and effort, a fun and engaging game board can be created. Thanks for the writeup and we’re glad that you’re enjoying the site! We’ve done our best to make the process as simple and straightforward as possible. We’re also proud of the fact that is works on tablets and other mobile devices, though we’re continually making efforts to improve and refine the mobile experience. We think the new flashcards feature (releasing in the next few days) will be worth the upgrade! Especially with the ability to swipe through questions on smartphones. It will give students the ability to study from anywhere (like boring waiting rooms or theme park lines)!